Newer version of Skype automatically pins to Windows 7 taskbar. Even if you click X at top right of Skype window, it does not go away easily. You need to perform a longer routine to remove Skype from taskbar – right click on Skype tab on taskbar and then click on ‘Quit’ option. You can close Skype window quickly like we did in older version, for this you need to customize Skype settings for taskbar. 1. Open Skype and sign into your account. 2. Then goto Tools > Options from the top menu. 3. In Skype options window, click ‘advanced’ tab on left side. 4. 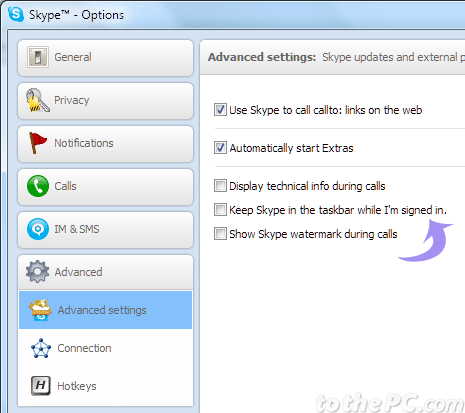 Then uncheck (no tick) “Keep Skype in the taskbar when I’m signed in” option. 5. Then click Save button at bottom to close Options window. From now on, clicking X sign at top right will close Skype window. No more Skype sticking on Windows 7 taskbar!